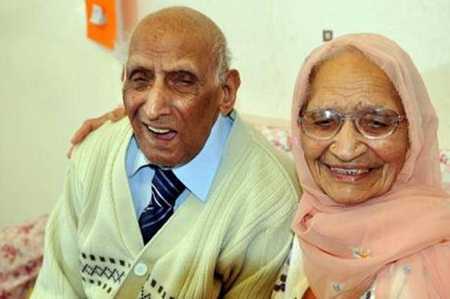 World's Longest Married Couple - For 87 Years! 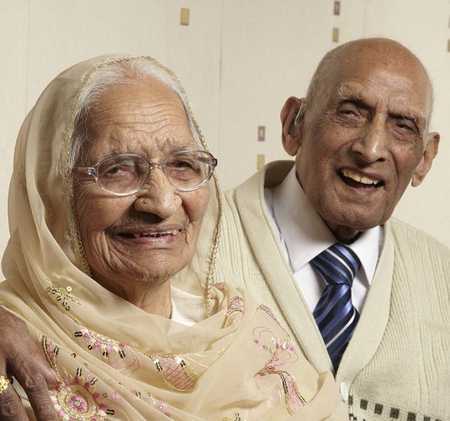 In an age where few marriages endure the test of time, 107-year-old Karam and his wife Katari Chand, 100, are proof that happy ever after does exist. 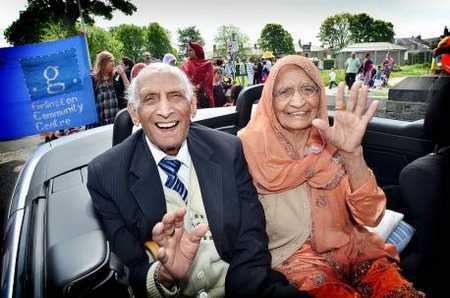 The couple, who have eight children and twenty eight grandchildren together,have lived in wedded bliss for 87 years making them the world's longest married couple. The pair say that the key to success is looking after each other in every way possible: ‘My trick is to make Katari laugh. I like to tell jokes and make her smile. Being funny is my way of being romantic.' says Karam. 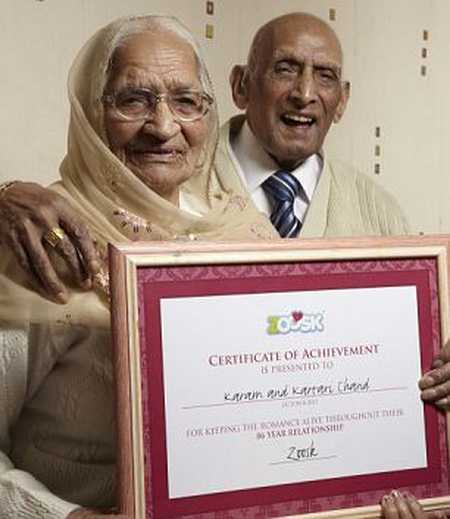 Karam and Katari Chand have been married for 87 years and are in the process of being confirmed as Guinness World Record holders for the world's longest marriage. ‘I have been told laughing makes you live longer. my wife is still alive so it must have worked! I love her so much and I want to spend another 80 years by her side,’ said Karam. 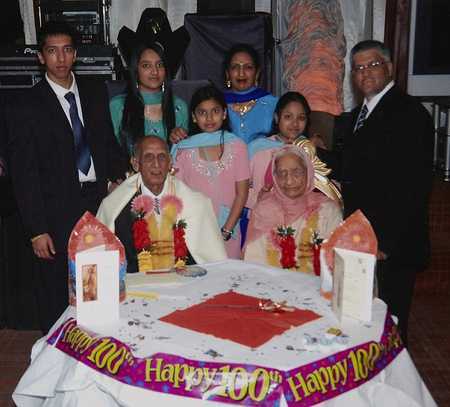 From romantic meals to sharing jokes, the couple, who hail from Punjab, India and now live in Bradford ensure that they do little things for each other to keep the romance alive. Katari told romantic networking site Zoosk.co.uk:‘When I was young I used to make him a nice fresh meal every night. We are vegetarian so I brought lots of fresh vegetables and made sure he was eating healthy food. ‘Health is very important and I wanted to look after him so we could grow old together. Some would say it has worked! 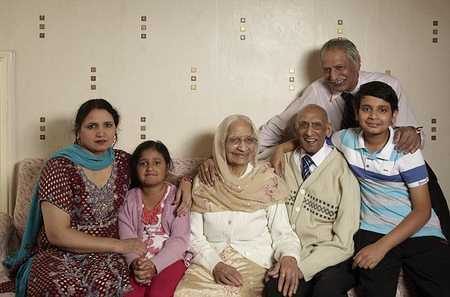 The couple, who are both over 100, have eight children and twenty eight grandchildren together. ‘Oh and how can I forget, I always save a bit of my chapatti for him. 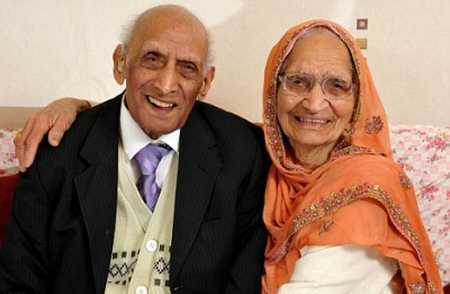 Just a little gesture that he appreciated a lot and it kept me a bit slimmer.’ Karam, who likes to do a word search every day to keep his mind alive, believes that spending plenty of time together has helped their marriage last. ‘We have not spent any long span apart in over 50 years. We go everywhere together – up until a few years ago we went to India every year with the family and for all family weddings we make sure we get to stay together,’ he said. Their marriage has lasted nearly five years longer than that of the current Guinness World Record holders and the couple are in the process of getting confirmation from the company that they will be named as the new record holders. Many modern day romances fail to stand the test of time but longevity and experience makes Karam the best man to go to for relationship advice. ‘In the past people used to listen. Now I don’t think people take the time to listen to each other properly. People seem too busy today with work, TV and other stuff going on around them. ‘Relationships are about understanding one another and listening to concerns and problems, so my advice to men and women is to listen to their partners, show interest in what they are saying and help them overcome any worries or problems they are going through,’ he said.